Nutmeg Retail operates three distinctive boutiques in Petersfield, Witney and Chipping Campden which offer some of the best in British and European contemporary womenswear brands. 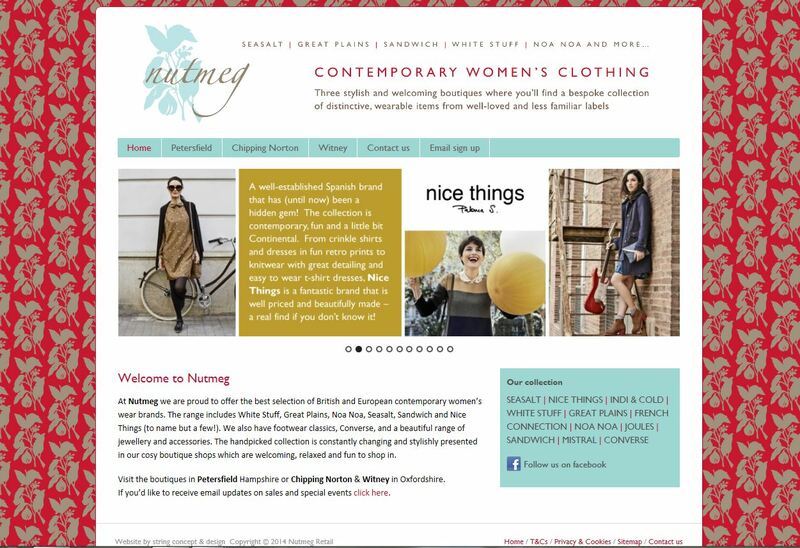 They invited us to develop a new website to reflect the welcoming, fun and individual atmosphere of their shops and enable Nutmeg to showcase the various brands available at each – a range that includes White Stuff, Great Plains, Noa Noa, Seasalt, Sandwich, Ese-O-Ese and Nice Things among others. It is the place to go for footwear classics, Converse, and also offers a beautiful range of handpicked jewellery and accessories. Visitors to the site are able to sign up to receive information on sales, new brands and special events.